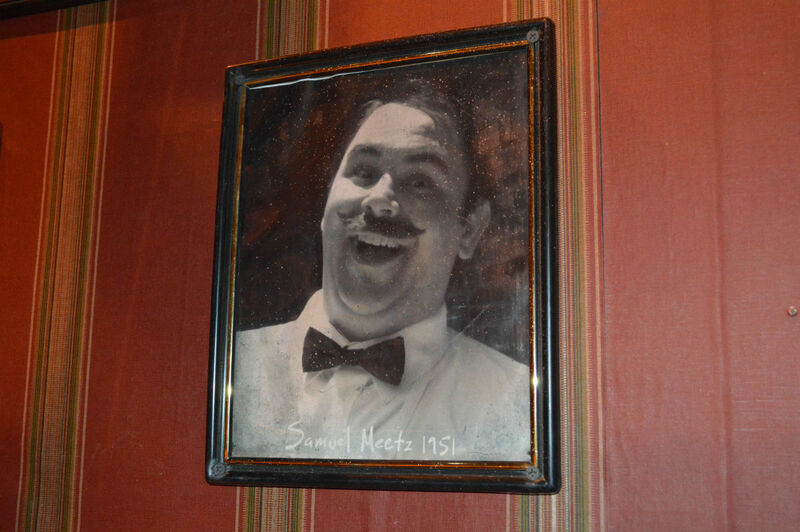 Resident Evil house has this picture of Mike Aiello, Creative Director of HHN t.. It has been repurposed from the Leave It To Cleaver house at HHN 19. This week’s Saturday Six looks at the Top Six Hidden References in Halloween Horror Nights 23’s Haunted Houses. We’ve already done Saturday Sixes on what we loved about HHN 23 and even our favorite food and drink items from the event, but we also took both the Morning Menace and Afternoon Abominations Unmasking the Horror Tours. These were lights-on tours of six of the haunted houses with a personal tour guide from Universal. The Morning Menace tour led us through La Llorona, The Walking Dead: No Safe Haven, and The Cabin in the Woods. The Afternoon Abominations tour took us to Resident Evil: Escape from Raccoon City, An American Werewolf in London, and Evil Dead. There are two major things we came away from when the tour was over: 1) We are 100% doing this tour next year and every other year it is offered. And 2) There were so many things in the houses that we never saw when we walked through them during HHN 23! We were blown away at the level of detail when we walked through the conga line during the actual event, but to be able to explore these houses and to see the level of craftsmanship involved in areas that no one will ever see except during these tours was worth every penny we paid. We’ll cover the tours in full very shortly, but let’s get on to the list of the top six hidden references! One of the rooms that guests walk though in An American Werewolf in London’s haunted house is a recreation of the apartment living room where the conversation between “Jack” and David took place. 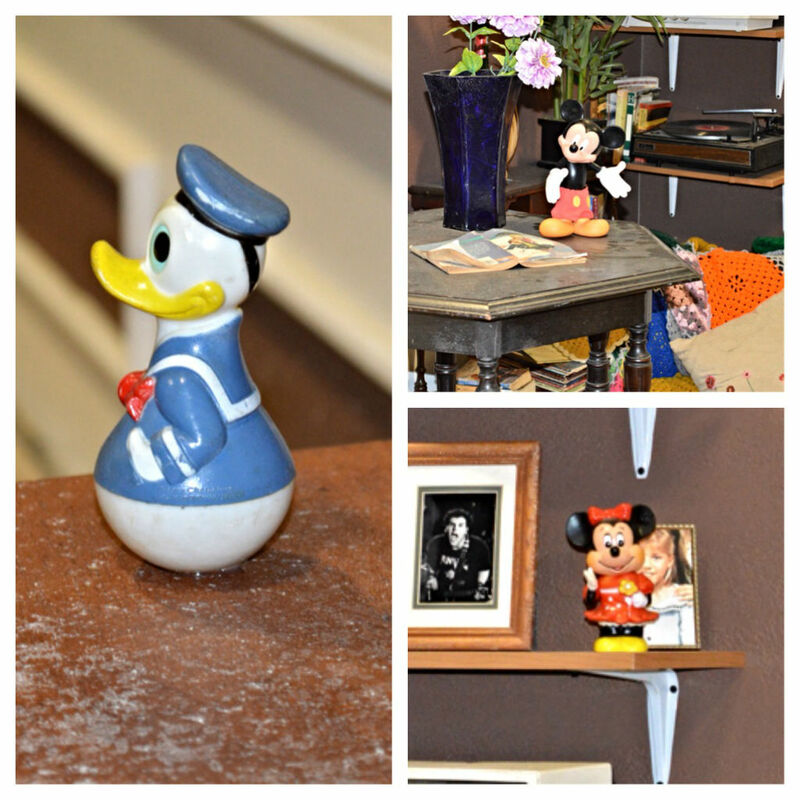 This room is filled with items faithfully recreated from the late 1970s/early 1980s era that the film took place in, including the three Disney characters that are on display in the movie. This living room is the same room in the maze in which you see David’s “transformation” into a werewolf and is the only room in the entire HHN experience that Universal stops the flow of traffic into the room in order to change out the actors working inside of it. This was one of my favorite surprises of the tour. I really enjoyed the 20 Penny Circus performance at HHN 22 last year. They bill themselves as “Entertainment For People With…Questionable Taste,” and I thought they provided a really unique take on your standard magic show. I was hoping they would return for this year, but instead Rocky Horror Picture Show – A Tribute made its return to HHN at the Beetlejuice’s Graveyard Revue stage. The 20 Penny Circus themed bottle is almost impossible to see unless you are doing an Unmasking the Horror tour because it is used more for atmosphere and not something that the house is deliberately trying to get guests to notice. 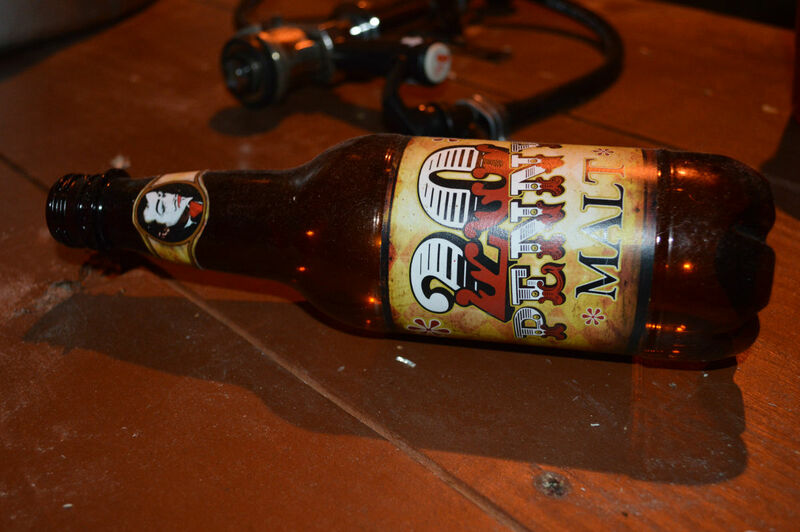 20 Penny Circus malt, along with “Aass Ale” (another beer made up by Universal Creative), can be seen in both The Cabin in the Woods and Evil Dead houses. Since I’m not big fan of horror movies in general, I can actually thank Halloween Horror Nights for being a reason I finally watched two classic films that I might not have ever watched otherwise. Believe it or not, I had had never seen An American Werewolf in London until I realized that I needed to watch it before going to HHN this year, and a couple years ago I finally broke down and watched John Carpenter’s The Thing because of its involvement in HHN 21. Even to a non-horror fan, both these films were incredible. I actually became such a big fan of The Thing that I watched the new version of The Thing from 2011, which is actually a great prequel for the original movie. Universal likes to repurpose effects used in previous years, and since they did a house for The Thing for HHN 21 they reused some of the elements from it in two houses this year. In An American Werewolf in London, you’ll see some of the human characters sitting in the adult theater watching See You Next Wednesday. Meanwhile, over in The Cabin in the Woods house, some of the incredible monster effects were used in the second half of the house when all hell breaks loose. The horror movie genre is filled with certain character archetypes that continue to scare viewers. Zombies, hillbilly rednecks, and clowns are among the most well known. Another? Puppets. Halloween Horror Nights has had houses in the past based around evil puppet characters including Chucky from Child’s Play, the Jigsaw puppet from Saw in 2009, and Billy from Dead Silence in 2007. 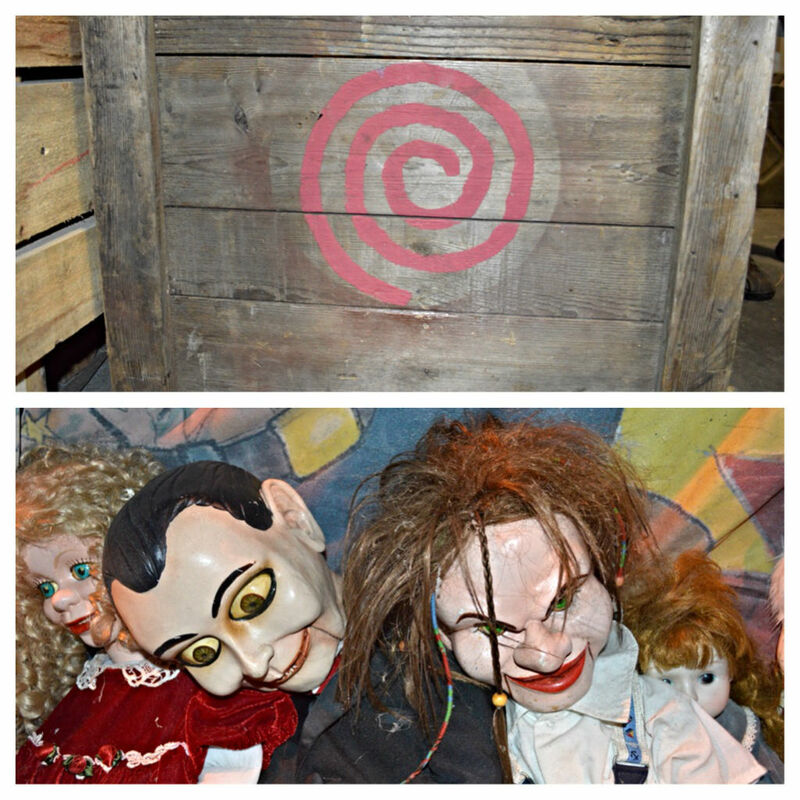 This year HHN pays tribute to a couple of those houses with a reference to the Jigsaw logo in Walking Dead: No Safe Haven and the Billy puppet in The Cabin in the Woods. To see the Jigsaw logo, pay attention to the crates in the interrogation room while you are in the town of Woodbury. The Billy doll is in the room from Cabin which has all the horror elements in which the characters could choose from to trigger whichever monster would terrorize them. Here you’ll see the conch shell that would have called the Merman, the music box for the sugarplum fairy, and of course the diary that calls forth the Zombie Redneck Torture Family that we see in the film (and the lovable Buckner family is represented throughout the first half of the Cabin haunted house experience, as well). Nestled in between a bunch of creepy looking dolls is Billy himself. This was a jaw dropper for me and something I didn’t have a clue about when walking through the Waking Dead house the night before. There are two rooms inside the prison sets that stood out to me. One had the rotary style telephone that was used in the show to show that Rick was losing his mind. You found out later he was “talking” to his dead wife Lori. Universal created that phone, and when you pick it up it triggers a voice effect from Lori talking to you. Great stuff. Almost all of the elements of these houses are triggered by the actors themselves, but this is one the guests have a hand in. 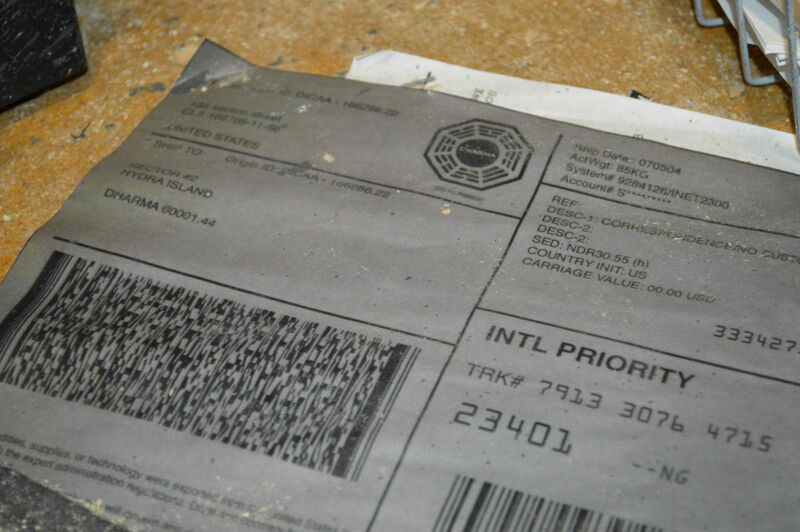 The second room has the dead body of Lori inside and nearby on a desk is paperwork which has the logo from the DHARMA Initiative, who – like the Governor in Woodbury – played foils to our heroes on the TV show Lost. As if you needed another reason to love An American Werewolf in London house. We’ve already discussed the nods to Disney, using characters from John Carpenter’s The Thing, and the fact that they recreated an adult movie theater within a theme park, but we haven’t even mentioned the insanely detailed wolf puppets that are throughout the attraction. These puppets have that “wow” factor that only comes with something truly special, like the first time you see the Transformers characters for photo-ops. Need more? How about a faithful recreation of the Slaughtered Lamb pub, detailed to the point where John Landis pointed out that a hat hanging on the rack needed to be brown like it was in the film. For me, though, the true highlight of this house was seeing tributes to former Universal attractions Jaws and King Kong. This was actually an another repurposing of previously used show elements, but the more acknowledgements we can get to Jaws and Kong into the parks, the better. I feel one trait that Universal comes up short in is acknowledging its own history. While Disney over-delivers to its fanbase when it comes to nostalgia (whether it be through pins, vinylmation, or references inside the parks), there are Universal fans who desperately miss long-gone attractions like Back to the Future, the Ghostbusters stage show and even seeing the old Bates Motel. For them, there is very little history to collect or appreciate. 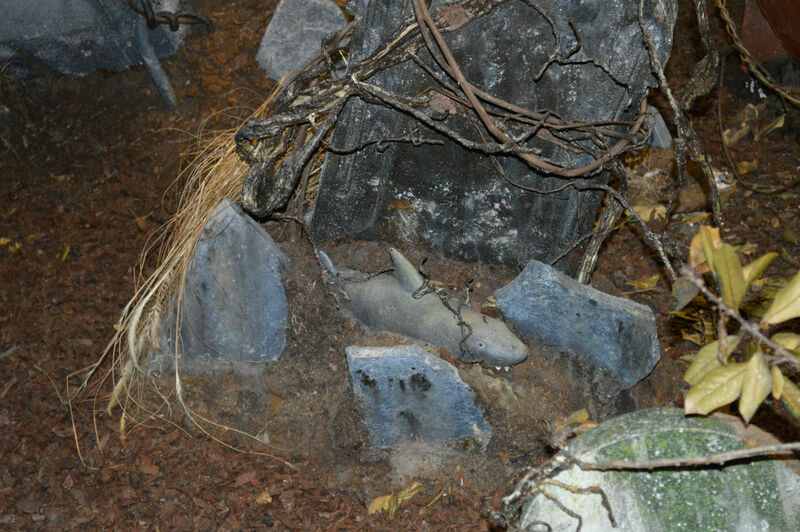 So when walking through the Werewolf house, getting to a graveyard scene and seeing little tributes to Jaws and King Kong really make this experience special. Most of the work inside theme parks, and this includes Halloween Horror Nights, goes un-credited. We may know a name of an Imagineer here or there or someone like Mike Aiello at Universal, but it takes hundreds of people to produce the final product. From the people who put pen to paper and design the attractions, to the people fabricating the actual show elements, to the team members/scareactors putting the cherry on the top of the sundae as they guide us through the journey, it truly takes a village to create the theme park world we love so much. 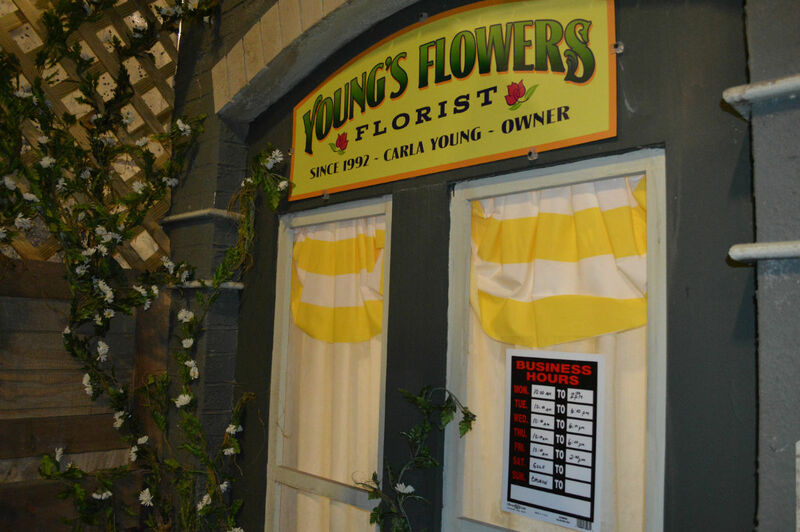 We almost never learn about many of the people who work tirelessly to provide us with the park entertainment, but one such person, Carla Young, is immortalized in Walking Dead: No Safe Haven with a flower shop façade in Woodbury dedicated to her name. See you next weekend for the latest edition of the Saturday Six. If you had fun, be sure to check out The Magic, The Memories and Merch! articles or head on over to the TouringPlans.com Podcast Network and check out Universal NOW! and Pardon the Pixie Dust. 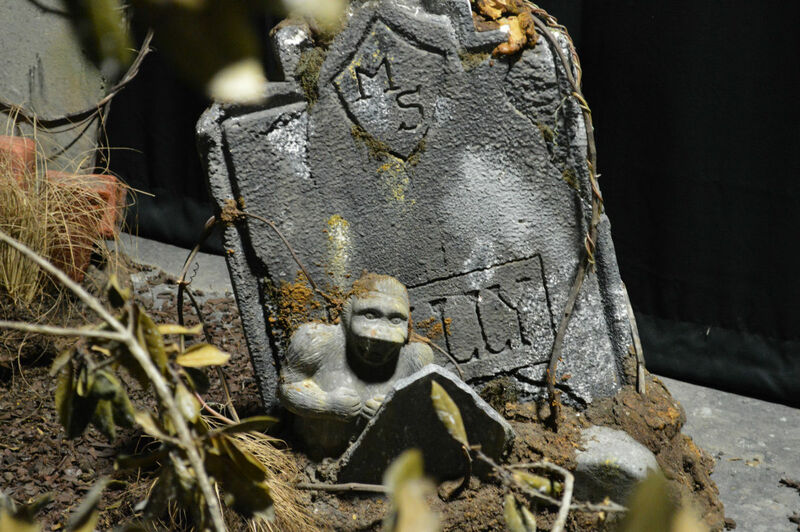 Halloween Horror Nights takes place on selected nights from September 20 through November 2, 2013. For more information and to buy tickets: click here. Special thanks to Brandon Glover and Zeus Navarro for their assistance with this week’s Saturday Six.